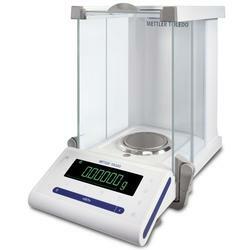 MS Semi-Micro Balances are equipped with high-precision weighing cell from METTLER TOLEDO that provides up to 5-place readability and guarantees constant accuracy, precise results and fast settling times over the entire weighing range. With two buil-in weights, combined with FACT (Fully Automatic Time and Temperature controlled internal adjustment), the MS Semi-Micro Balances carry out adjustment and linearization automatically. Space Saving Save working space with split draft shield doors that do not project beyond the balance, and sideways mounted connectors at the back of the balance. The clever ErgoDoor draft shield saves time: you can simultaneously open the door with one hand, while using the other to place your sample. An intelligent menu guidance in your language makes operating the MS Semi-Micro Balances very easy and the large brilliant numbers allows error-free reading, even from a distance or at an awkward angle. The robust housing protects the weighing sensor to guarantee consistency and precision year after year. It is resistant to most chemicals, including acetone. Quick to convert for pipette testing Convert your balance into a pipette-testing station by installing an evaporation trap. The built-in application guides you through the process. Easy to clean Remove, clean and reinsert all of the QuickLock draft shield glass panels in just a few simple steps without tools and without moving the balance.